I hope everyone is happy, happy, happy Lol! and managing to fit in some special crafting time. The card I have to share with you today was made in January 2012 and it uses Imagination Craft's Spring Decoupage Stamp Set - Primrose. I have used some soft pastel shades for this card which gives it a fresh, light Spring feel. A card to lighten the heart after the Winter months. Well let's get started shall we. First of all, make a base card from pale blue card. Take some peach card and lay the Summer Blossom Stencil onto it and put it through an embossing machine. Fix this to the base card, wrapping some ribbon around it and securing on the back of the card. Take some white card and colour with the yellow distress ink. Stamp the swirl stamp from the set onto the yellow card using orange distress ink. From the yellow card, cut out an oblong and mount onto a piece of the blue card, leaving a tiny border of blue showing. Fix this to the right-hand side of the base card and add three adhesive stones to the top right. Take the die and some blue card and run it through a die cutting machine. Fix this to the centre of the base card and fix a square of peach card to the centre of the blue die cut. 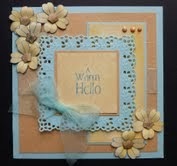 From the yellow coloured card, cut out a square to fit the peach card but slightly smaller and stamp 'A warm hello' onto it using the blue distress ink pad. Add a ribbon bow to the bottom left of the lacy square. Colour some white card with the yellow distress ink and stamp the small primrose flower head six times using the blue distress ink. Cut out and fix to the card front with Magi-Glue. Stamp out another six flowers onto peach card but this time cut out the centres only and glue these onto the yellow flowers using silicone glue. Well that is the card finished. Until next time, happy crafting and see you soon. For today's card I have chosen another Christmas card made using Imagination Craft's beautiful robin decoupage stamp set and of course some fabby sparkle medium !! I really love using this as you get an instant background as a base for your central image. Well let's get started. Make a base card from red cardstock and matt some white card onto it leaving a small border of the red showing. Take a piece of shiny green card cut slightly smaller than the white. Lay the holly embossable on top and spread the silver sparkle medium over it with the palette knife. Remove embossable and leave to dry. When dry, matt this onto the white card. Cut an oblong of white card approx. 2" x 5" (sorry I still work in feet and inches lolls!!). Next cut a piece of red card slightly smaller and using the dots embossable, run through an embossing machine. Matt the red onto the white oblong and fix to the left-hand side of the base card. Take some white card and stamp the main image of the robin onto it using a Versamark pad and heat emboss using silver embossing powder. Stamp a further five images and colour with the Vintage Pearly Palette. Cut out and 3D these onto the first image, using silicone glue. 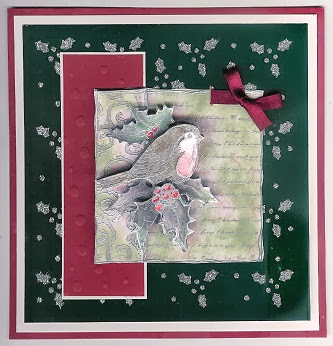 Use the Bundled Sage Distress Ink on the background of the image and colour the holly berries with the red from the Vintage Pearly Palette. Fix the main 3D image to the base card with the left-hand edge over the red card, and add a red ribbon bow to the top right of the main image. That's it , that's all for now until the next blog. Have a good week all. I'll be back soon. Tonight's card was made for Sue and Harvey of Imagination Crafts in February 2012 which seems a long time ago now. Where do these months and years go to I wonder ? We are talking of summer holidays one minute and the next we are preparing for Christmas lolls !! Having said that, I do enjoy the Christmas period, especially as our Grandson is still young enough to dream of Santa, although today he did ask me - " Grandma, is Santa Claus real ?" Enough chat for now, it's time to explain how I made this card. 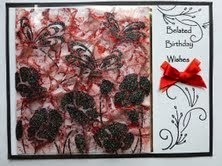 Make a base card from black cardstock, landscape style. Onto this matt a piece of white card, leaving a border of the black card showing. Using the Versamark pad stamp the text and the flourishes on the right-hand side of the white card and heat emboss using black embossing powder. 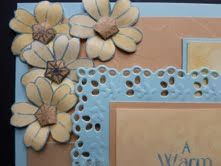 Take a piece of white card and colour with the Fired Brick Distress pad and a blending tool. When this is dry, crumple up the card, then straighten out again. 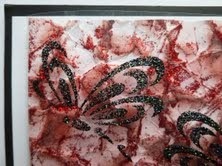 Spread a thin layer of the red sparkle medium over the card using the palette knife and leave to dry. When dry, fix the acetate to the crumpled card, making a slight bow shape, securing the acetate on the back of the crumpled card. Matt this onto the base card and add a narrow gold strip down the right-hand edge of the acetate. Add a red ribbon bow. Voila ! we are finished. Thank you for visiting, we do value your opinions on our creations, and hope that you find some inspiration for your card making. Until the next blog, take care and happy crafting.